Beyond the widespread entrepreneurship romance and startup honeymoon, the St.Galler Startup NavigatorTM primarily provides a systematic guide to avoid slipping into the trap of failure after initial euphoria. By taking off the startup runway with the Navigator’s Startup Cockpit, your chances of success are increasing. 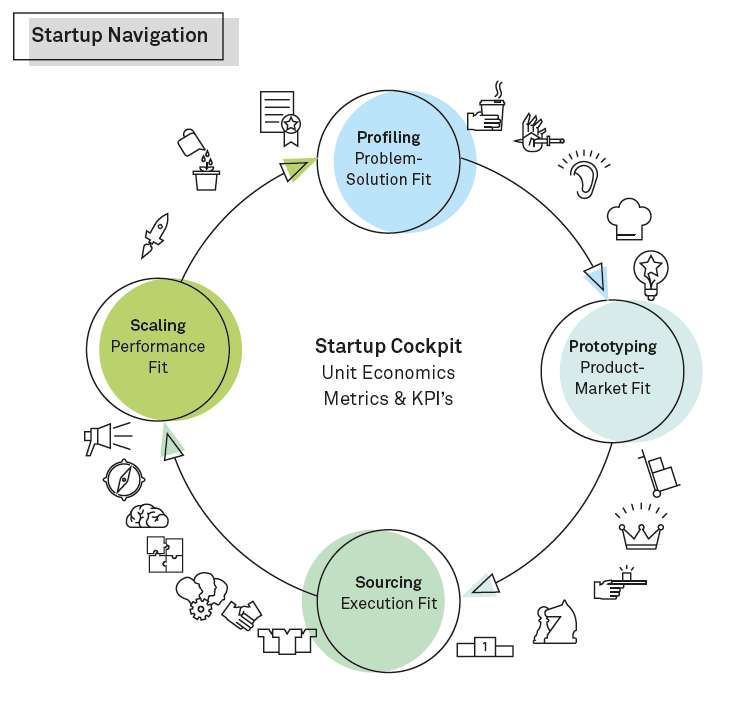 The Startup Cockpit leads the chronologically oriented implementation of your business idea. It guides you through the main Navigator phases of Profiling, Prototyping, Sourcing, and Scaling. The beginning of an affair! Profiling of your customer(s) leads you to judge if there is a valid problem-solution fit. Starting from your individual motivation as an entrepreneur, you develop a unique solution that solves the customer problem by fulfilling the problem’s painful jobs. If you have previously identified a problem that it is worth solving (problem-solution fit), you now need a product that is worth buying. Prototyping guides you the way towards the product-market fit. This is the sweet spot of the Startup Navigator. Sourcing orchestrates the necessary resources for the startup execution (execution fit): Co-creation combines the team resources with partners in your network. By defining requirements, intellectual property (IP) and your affordable loss (risk compass), a call to action can be formulated and translated into a clear roadmap. Ready for scaling! Scaling closes the magical circle with a performance-oriented business model (performance fit). Funds required for your undertaking are negotiated with investors in terms of a potential deal and exit strategy. For more information on the St.Galler Startup Navigator browse our Website, get the tool here, buy the book (yet in German) and make an account to stay up to date!